M. Daniel DeCillis is Senior Research Associate & Director of Web Operations at the California Council on Science and Technology, where he has worked since 2001. He has been principal project writer on studies including the Overview of California State-Funded R&D, 2004-2007 (2008), Critical Path Analysis of California’s Science and Mathematics Teacher Preparation System (2007), An Industry Perspective of the Professional Science Master’s Degree in California (2005), Opportunities for Collaboration in High-tech Research and Teacher Professional Development (2004), the Critical Path Analysis of California’s Science and Technology Education System (2002), and The Preparation of Elementary School Teachers to Teach Science in California (2010); he has also contributed substantially to CCST projects on nanotechnology, energy, and intellectual property. In addition he designed and edited the Workforce Investment Board Online Toolkit (2008), a major component of CCST’s contributions to the California Innovation Corridor project. In 2011, he edited and reviewed Imagining the Future: Digitally Enhanced Education in California and components of California’s Energy Future. In 2012, he completed the California Climate Change Research Database website. He was part of the team that produced the 2014 report Achieving a Sustainable California Water Future through Innovations in Science and Technology and a co-author on Promoting Engagement of the California Community Colleges with the Maker Movement (2016) and The Maker Movement and K-12 Education (2017). 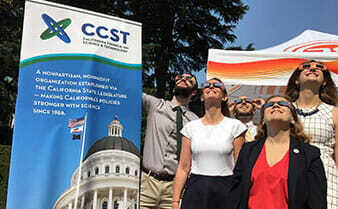 DeCillis has presented CCST’s work on a variety of projects in numerous venues (including the Legislature and the National Academies) both in California and abroad. Since 2002, he has served as primary writer and editor for CCST’s Annual Report and newsletter; he is also responsible for design and management of the CCST website. From 2001- 2004 he served as the Managing Editor for the Journal of Robotic Systems. Prior to this, he worked as a paleographer and French instructor; he holds an M.A. and a Ph.D. in Romance Studies from Duke University and a B.A. with High Honors in French and Latin from Oberlin College.